When it comes to pulling power few clubs in world football can rival Real Madrid in the transfer market. 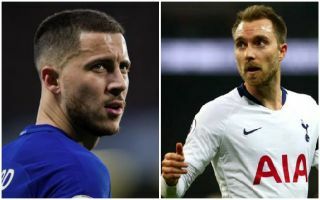 And that may be bad news for Chelsea and Tottenham Hotspur because the European champions have reportedly set their sights on Eden Hazard and Christian Eriksen. According to The Sun, Real are planning to bid for both players in the summer and will start with offers of just £50million per player due to the fact their current contracts are due to expire in June 2020. The Sun claim that Real expect to see their opening bids rejected and indeed they should. Last year, as reported by BBC Sport, Barcelona paid £142million for a 25-year-old Philippe Coutinho who had produced 41 goals and 35 assists in 152 Premier League games for Liverpool. Hazard turned 28 last week and boasts 79 Premier League goals and 49 assists in 208 Chelsea games, while 26-year-old Eriksen has contributed 45 goals and 55 assists in 189 matches for Spurs. To offer £50m for either player, even as a cheeky opener, is nothing short of insulting regardless of their contract situation. Real know that they have the potential to turn a player’s head with an official offer whatever the price. If they do indeed start as low as £50m it will lack class and reek of cockiness, but that won’t necessarily stop them getting what they want.